Today was the Great Cloth Diaper Change for 2012 and the goal was to get over 5000 diapers changed, at least, that’s what I think. So we registered as soon as the closest store announced they were going to hold the event. Unfortunately, the baby got sick last week and was not ready to go today. Having really, and I mean REALLY!!!! wanted to go, I left him with hubby and went. My cousin, her daughter and my aunt went with me and changed their baby as part of the 31 participants. I got to meet a few moms that I’ve talked to before, and a few I’ve only chatted with online. Amber from TheClothDiaperConvert was there with her new venture Tumblewool and I was seriously impressed. She sells dryer balls at 4 for only $24. When I purchased some for my step mom I paid $8.50 each for 4, a total of $34. My cousin’s baby wore a Thirsties tree print pocket diaper with hook and loop closure for her change. She was adorable. It was her mom’s first time using a cloth diaper. They ended up having a ball at the event. 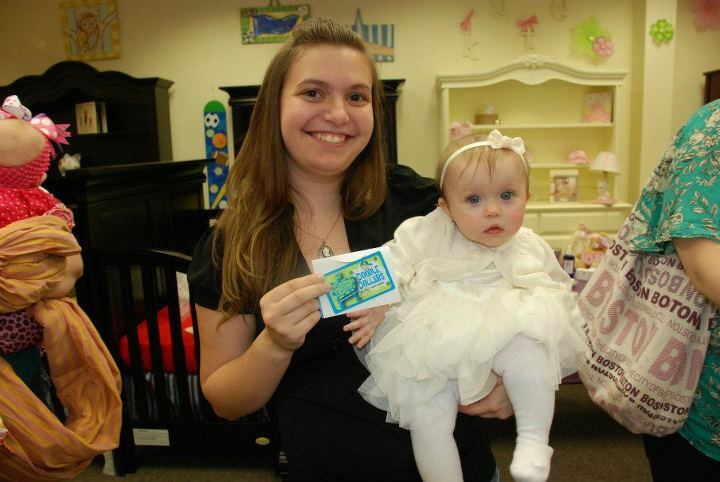 She purchased some ChewBeads, that are great for teething, with the Gift Certificate she won, and a GoPod. It’s an exerciser that folds up for travel, see one here. I’m actually thinking about getting one of those. The event was a lot of fun and it was exciting to be around so many moms who love cloth diapering. I can’t wait to try my new diapers out, please, tell me how was your day?